350,000 spectators from around the world have flocked to Rio for the Olympic Games. 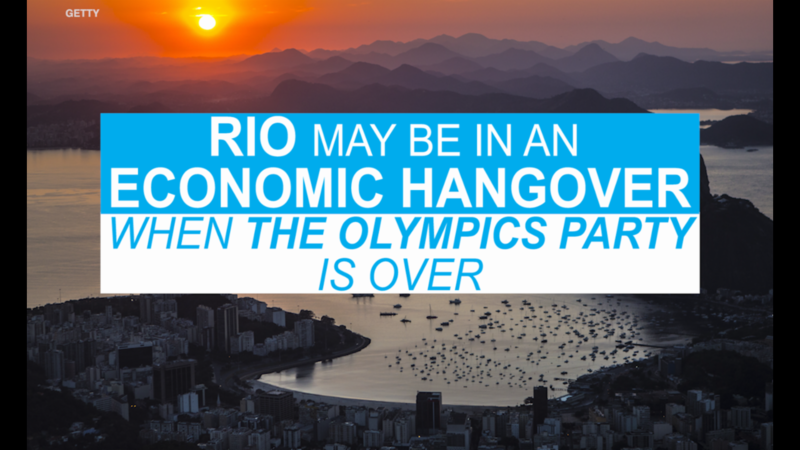 But many believe that's not enough to pull Brazil out of the longest recession in its history. The Games have been estimated to cost Brazil at least $4.6 billion, which is less than the cost of the London 2012 and Sochi 2014 Olympics. But, it is still a lot for a country that has been in an economic recession since the 1930s. Local hotels and airlines are expected to get a boost from visitors during this time, but these short-time benefits are being overshadowed by larger issues. Unsold tickets, crime and environmental concerns have all plagued the games in Rio. Meanwhile, the impact of the Zika virus remains a wildcard, and the country's president and political hierarchy have been in turbulence for months. One benefit to Rio is the addition of $7.1 billion in new infrastructure, which includes road and subway expansions as well as new sports complexes. There is hope that Brazil will have a boost in tourism in the years after the Olympics end. But Greece remains a cautionary tale after its economy collapsed following its hosting of the Games in 2004. Fun Fact: She has broken 12 world records and continues to breaks the records she sets. Fun Fact: Lily King's comment on Russian swimmer Yulia Efimova testing positive for doping caused quiet a stir. Fun Fact: The incredibly talented ladies of the US Gymnastics team beat Silver medalist Russia by 8 points, making them virtually untouchable. Fun Fact: She is the only cyclist, male or female, to win three consecutive golds in her event. Fun Fact: Simone is the first female gymnast to win four Gold's in a single Olympics. Fun Fact: Simone is the first African American to win an Olympic Gold in a individual swimming event. Fun Fact: Michelle is the first American woman to win Olympic Gold in Shot Put. Fun Fact: Tianna not only earned gold but set a personal best for herself with a jump of 7.17 meters (23 feet, 6 1/4 inches). Fun Fact: Brianna led her teammates in a sweep of Gold, Silver, and Bronze medals in the 100m Hurdles becoming the first American women to do so. Fun Fact: This relay almost didn't make it to the finals. In the preliminary heat Felix dropped the baton but instant replay showed a Brazilian team member bumping her which granted them a rerun to qualify for the final race and bring home gold. Fun Fact: Winning this event makes Team USA the first team to ever win back to back olympic gold in waterpolo ever. Fun Fact: Jorgensen's win is the US's first ever Olympic gold in the Triathlon. Fun Fact: This is the US women's basketball teams sixth straight Olympic gold. Fun Fact: The US has now won Gold in the 4x400m 6 times in a row. Fun Fact: This win in Rio is Shields second Olympic gold making her the first American boxer to have back-to-back Olympic golds.